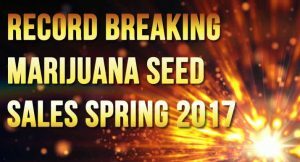 I would like to take a moment and thank everyone for legends record breaking marijuana seed sales Spring 2017. It’s been a really busy spring and we’re happy to announce a record breaking year, we have sold more seeds in the first 4 months of 2017 than we have in any previous 12 month period. With the global legalization movement, cannabis seed sales are heating up more than ever before. Sales are exploding in countries like Canada, USA and Australia that will be legalizing recreational cannabis in the near future. Even though in many states cannabis is not yet legal, people are pushing forward anyways and growing now. We have fulfilled most orders but we are aware many of you could not get the strains you wanted in stock. We are working very hard to increase our seed stock but to maintain quality control we ask you to be patient. We also thank you for over 20 years of customer loyalty and this month we are giving away very fruity and potent feminized cannabis seeds for free.